Monday night’s doubles match took center stage at the BB&T Atanta Open at Atlantic Station, with the wildcard team of Nick Kyrgios and James Frawley pairing up against Alexandr Dolgopolov and Sergiy Stakhovsky. After local Georgia Tech Yellow Jacket, Chris Eubanks, lost a tough battle to wildcard Reilly Opelka in the opening match of the evening, the crowd avidly searched for an upbeat and thrilling doubles match to close the evening’s events. Nancy Kerrigan, two-time Olympic figure skating medalist, did the honors of the coin-toss for the featured match, continuing with the Olympic spirit theme for the week. 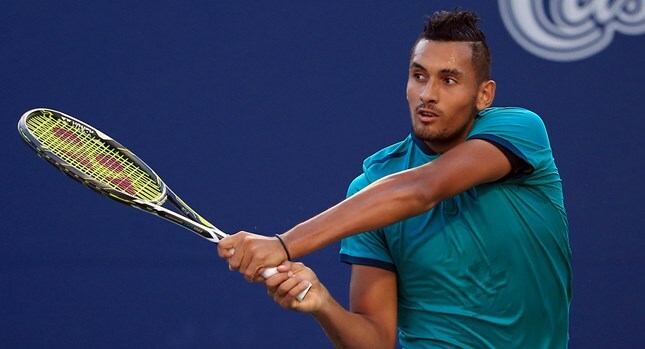 Kyrgios and Frawley, the duo from Australia, prepared to battle the Ukrainian team of Dolgopolov and Stakhovsky, under the lights in Downtown Atlanta. Kyrgios served to open the match, however the Aussies gave an early break. Trailing 0-3, with the crowd slowly churning for additional action, a significant momentum shift began to take place. Kyrgios and Frawley switched their tactics and slowly crafted net points to ease their way back into the match. With the score now tied 3-3, fans inched closer in their seats, awaiting the seventh game’s results. Dolgopolov and Sergiy, who seemed lively and light-footed from the start, earned the lead before the changeover at 4-3. Battle continued from 4-3, to 5-3, and back to 5-4, yet the Ukrainians ultimately clinched the first set 6-4. With the crowd supporting both teams and seeking a second set battle, action picked up with Kyrgios serving. Unfortunately, an early break struck once again, followed by Dolgopolov holding serve for the early, 2-0 lead. The Ukrainian team used net play, touch- volleys and overheads to overcome a handful of passing shorts from the Aussies, and they continued their steady lead. As the night progressed, Kyrgios and Frawley could not seem to find their way back into the match. A tense vibe overcame the pair and allowed Dolgopolov and Sergiy to serve out the match, holding at 6-0. The team looks towards their next match, facing the winner of Raja Purav (IND)/ Divij Sharan (IND) vs. Jonathan Erlich (ISR)/ Mariusz Fyrstenberg (POL) later in the week. Tomorrow’s action includes Hispanic Outreach in the Family Zone followed by "College Night" featuring former University of Georgia player, Austin Smith. Prior to the doubles, 18-year old Reilly Opelka earned his first ATP World Tour main draw match with a 7-6(9), 7-6(5) victory over Georgia Tech's Christopher Eubanks, ending Eubanks run that started in the Wildcard Challenge Pre-Qualifer in Atlanta.